Elongated fashion earrings. Stimulated pearl cased in a fashion rose string. Adjustable stem to wear earring close to earlobe or hanging along the neck. 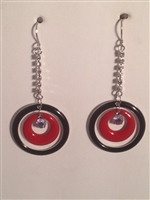 Fashionable drop earrings. Fashionable drop earrings. Fashionable stud earring that can be worn as standard stud or with bling under earlobe. 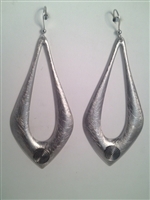 Dazzling elongated fashion silver earrings. Whether you rock it in one ear or both, you're sure to make a statement. Drop shaped white enamel and gold plated trim design to create that extra edge. Classy hollow out earring with white enamel and rose gold plated design. Classy fashion earrings. High elegance and rich look. Blue crystals set in fashion gold. Simply breathtaking. Rose gold plated venetian pearl earrings. Classic rose gold plated drop and dangle earrings with white enamel details. Classic venetian pearl drop earring with rose gold plating over zine alloy base. Perfect for casual or evening attire. Classic dark blue enamel drop & dangle earrings with rhinestone bling. Classy gold plated earrings with high grade cubic zirconia Elegant fashion earrings with high grade white and emerald cubic zirconia. Silver post. Creates a rich look. Stylish fashion hoop with sparkling bling Fashion gold plated huggie hoops with pave' cz. 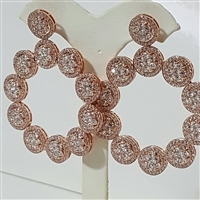 Classy and fitting for casual and evening attire Elegant and dazzling oval hoops. Cubic zirconia set in brass / rhodium finished. Wearable for any attire. Luxury and celebrity style earrings. High grade cubic zirconia and venetian pearls set in a brass base overlay with platinum. Sparkling & dazzling cubic zirconia earrings. Rhodium finish. High grade black and white CZ. 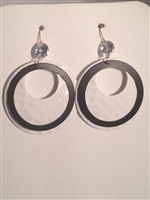 Fitting for evening or casual attire Elegant bezel circular cocktail earrings. These earrings present are dazzling and rich. Available in Rose or Silver. Flowing sapphire blue & white high end cubic zirconia. This necklace and earring set screams rich and elegant. Any attire this set compliments will truly stamp ones excellent choice of the finer things.